The Lover is Absent, a conflicted, enigmatic story of an entanglement in love told in New Age poetry. Jessica Smith born in Birmingham, Alabama has degrees in English Literature from SUNY Buffalo. She is the Poetry Editor at Coven Press and Foursquare and name magazines, and the librarian at Indian Springs School where she runs a poetry reading series. She has had numerous chapbooks published and 2 books of poetry, Organic Furniture Cellar (2006) and Life-List (2015). This is her 3rd Chapbook published by above/ground press and the first This Writer has reviewed for her. This long poem begins, presents a love interest, she is married, he is married, he is an entanglement, a place her thoughts go, the poetry of heat, conjecture, there is the connection, there is the loss of contact, there is the hope of contact, it is love as obsession, as in all great love affairs. The poem is enigmatic, did they or did they not connect sexually (perhaps once) has he died?, there is a church service, perhaps vows, perhaps a funeral and then the anonymous “he” brings her a coffee he has made. The ending is beautiful pulsates with hope, and may also present a double entendre, is the forbidden love interest also in some way her husband, the use of the anonymous "he". This poetry is like jewelry, a truth saying, an enigma, the disjointed and careening thoughts, the push and pull of forbidden love, the lines are discombobulated across the page. You can read the lines to the right or up and down, the affect is riveting, multiple readings of the conjoins of one line with others creating multiple layers of meaning, flow and connect/disconnect, the excitement in rapture. Years from now, this long poem, may be the only physical momento of the memory of this bewitchment, this magic of the perfect love interest. An offering to the goddess, the sky, the redemption for he who captures the moonlight, parce que nous ne savons pas. A brilliant read from above/ground press. 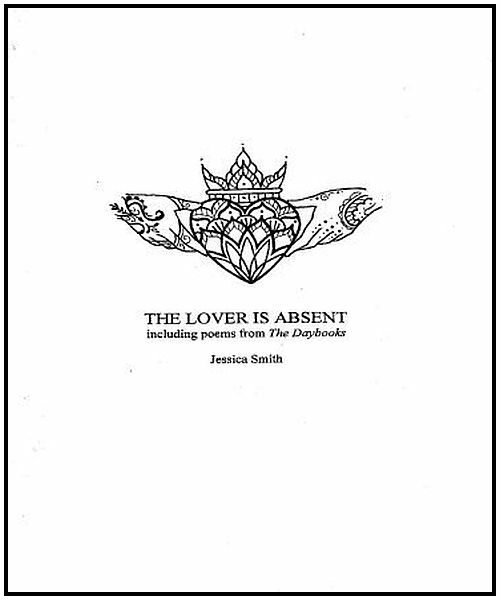 The Lover is Absent by Jessica Smith.